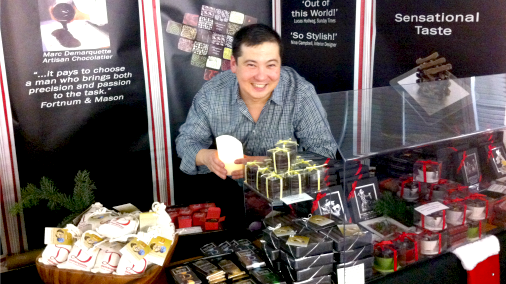 It was a very indulgent and special weekend at The Business Design Centre in London's Islington. 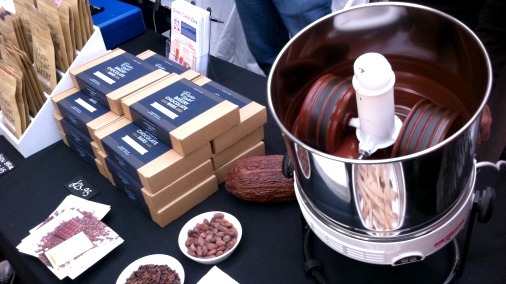 If you missed The Chocolate Festival, you missed out! The Business Design Centre in Islington played host to a mighty fine selection of chocolate makers, chocolatiers, hot chocolate specialists, patissiers and the like. A wondrously indulgent day out in the run up to Christmas. It’s a great place to shop for Christmas. So, I hope you enjoyed it too, and if you didn’t make it, note to self for next time! Paul Wayne Gregory is on message! All the lovely chocolate people are out in force. Here, the every charming Paul Wayne Gregory had been getting festively creative. His caramel space-dust chocolate lollipops have been the ultimate hit with every child I have given them to. 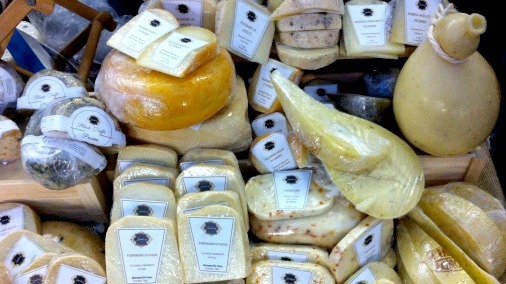 All things truffle and cheese from Lombary Gourmet. The event is foodie heaven, and it does help if you have a sweet tooth, but it isn’t all chocolate. There was a fine selection of brownies, cakes and patisserie, including some well-sozzled rum babas, and these excellent cheeses. I liked an aged pecorino with black pepper and white truffle. Lovely little bars never fail to please, at Rococo. However chocolate is the thing, and I was spoilt for choice. So many of the top UK must-visit chocolatiers in one place. 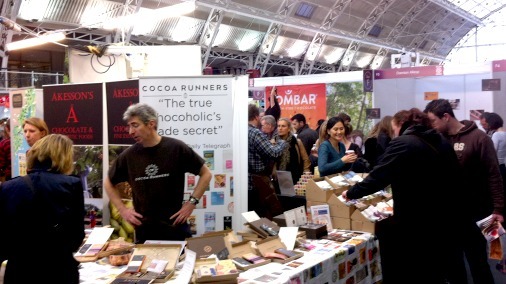 Rococo’s stand was busy and heaving with treats. I love these little bars, and the baubles (see main pic above) are beyond beautiful. A very merry Christmas, with Marc Demarquette. It was nice to say a Christmas hello to Marc Demarquette, seen here clutching a candle in an attempt to light his temporarily unlit stand. 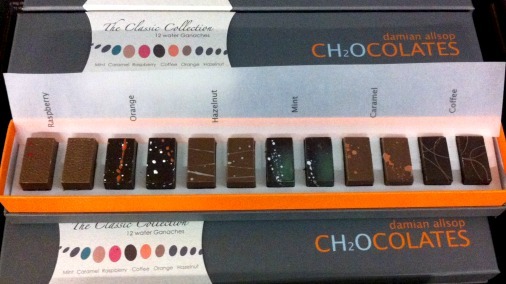 His seriously good chocolates should never be out of the spotlight. New for this year, a wonderful innovation, the Direct Cacao zone. This allowed visitors to clearly see which chocolate makers and chocolatiers are committed to Direct Cacao, which brings together those who buy cacao direct from farmers. Direct Cacao members pay a higher price for quality fine cacao, well above Fair Trade, and often much more. This is in order to source the finest tasting cacao, and to fight against the poverty that is the current lot of the majority of the worlds cocoa farmers. At the festival Martin Christy, founder of Direct Cacao, was on hand to inform and advise on the initiative. 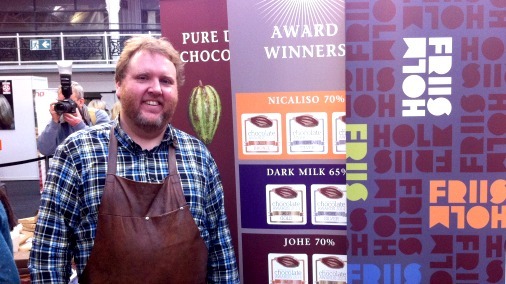 I also spoke to Frank Homann, founder and CEO of Xoco, gourmet cocoa champion and passionate supporter of Direct Cacao. All were agreed that the current crises in cocoa farming are very much linked to world prices, along with public perception of cocoa and chocolate. In order to bring you more on this important subject I will be publishing an interview with Frank Homann in 2015. 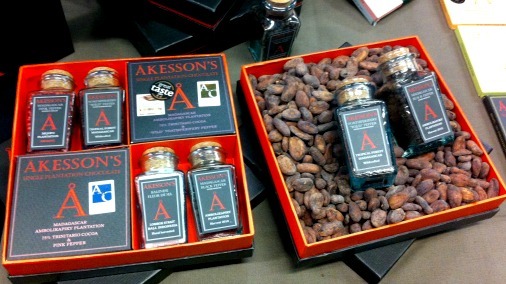 Member of Direct Cacao (as are all those mentioned below), Akesson’s, grow their own beans in Madagascar. They have recently opened a shop in London’s Notting Hill. At the festival they were selling their excellent chocolate, including the multi-award winning pepper infused dark bars, and jars of the precious pepper itself. The pepper is grown alongside the cacao at their plantation. The ever welcoming Mikkel Friis Holm, with a few of his awards. 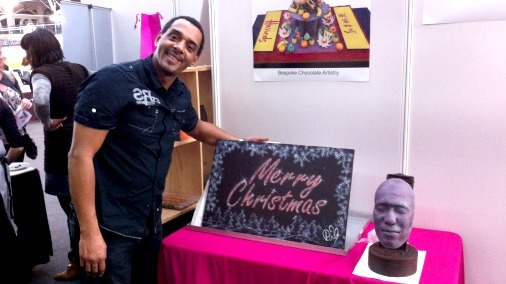 It is a joy of the festival that it brings together chocolate folk who are otherwise overseas. One such is the wonderful Mikkel Friis Holm, and I make no secret of the fact that his chocolate is a top personal favourite. The number of International Chocolate Awards gold and silver medals he has accrued, both at European and World levels, is testament to the fact that I am not alone in my passion. Stylish selection cubes at Friis Holm. 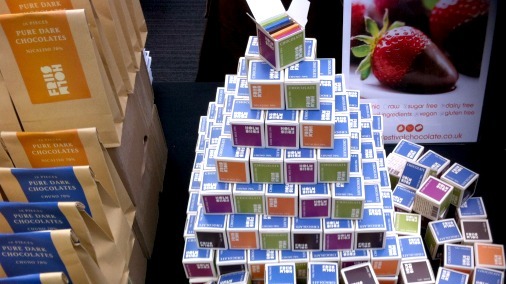 This little box of chocolate squares is a great idea, and the ‘tree’ of them looked divine. The perfect stocking filler for the serious chocolate lover in your life. Pump Street Bakery show how it’s done. A relative newcomer, Pump Street Bakery from Orford, are making tsunami-sized waves in the UK chocolate making community. Chris Brennan, whose sourdough bread is famous, has turned his hand to bean-to-bar chocolate with exceptional success. His chocolates are delicious, interesting, beautifully made, showcase each cacao to perfection, and were my great discovery of the festival. Do not fear, I will be writing more about Pump Street Bakery if I have to hitchhike to Orford to do so! From a new favourite, to an old. 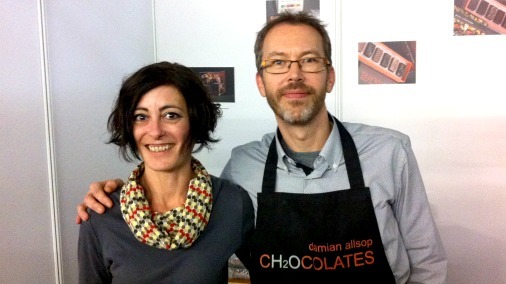 It was an absolute joy to see Damian and Anna from Damian Allsop Ch2ocolates. Their visits to The Chocolate Festival are a rare and precious chance to see them and taste their things, they are two of the hardest working people in chocolate! They were based in Frant, but now are that bit further, in Gerona, Spain, and are fresh from opening their new restaurant there Mimo Damian. I haven’t made it out there yet, but have it on VERY good authority that it is superbly good. I feel a foodie mini-break coming on! Go to Spain and taste their plantation menu if you possibly can. 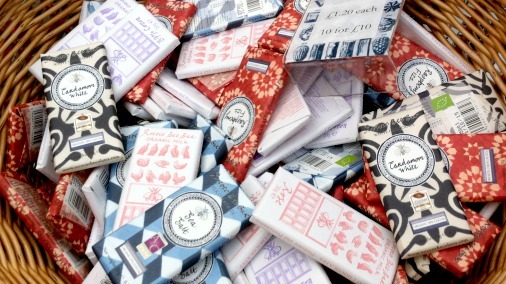 Perfectly fine chocolates, from Damian Allsop. 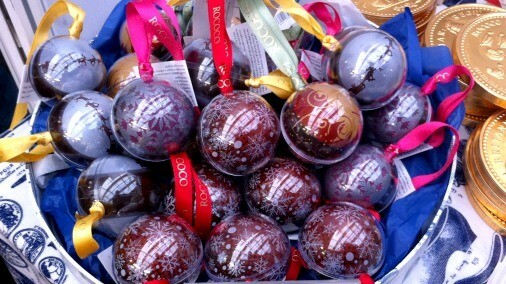 Or beat a path to The Chocolate Festival and sample some of the very best chocolates in the world. Whether these Classic chocolates, their Chefs Collection (collaborations with the likes of Angela Hartnett and Tom Kerridge), or the legendary Pure Collection showcasing some of the finest origin chocolate in the world, Damian’s water ganache masterpieces are utterly special. Chocolates do not get better. (Santa, hope you’re looking, I’ve been very good).